Gold was found in the surrounding area during the 1850s and this is reflected in the name of a nearby town of Eldorado where the remains of an old dredge can still be seen today. The Post Office in the area opened on 1 February 1843 as Ovens, and moved to the township and was renamed Wangaratta in 1854. The Ovens office, and the Kilmore office which opened the same day, were the fifth and sixth to open in the Port Phillip District and the first two inland offices. The nearby small town of Glenrowan located some 10 km away is known as the site of the final shootout that led to the capture of Australia's most famous bushranger, Ned Kelly. Wangaratta is the closest city or town of any size to Falls Creek and Mount Hotham, two of Victoria's three major snowfields. In local government, the Wangaratta region is covered by the Rural City of Wangaratta. 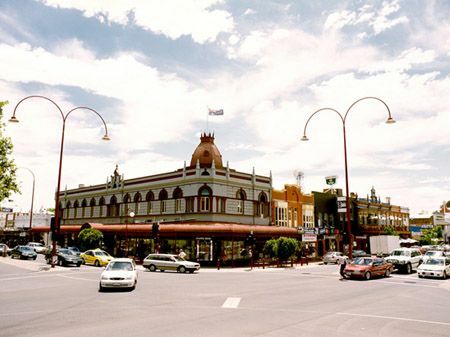 The council was created in 1994 as an amalgamation of a number of other municipalities in the region with the council chambers located at the Government Centre in central Wangaratta. The City is represented by seven councillors elected once every four years by postal voting. The mayor is elected from these councillors by their colleagues for a one year term. In state politics, Wangaratta is located in the Legislative Assembly districts of Murray Valley currently held by the National Party of Australia. In federal politics, Wangaratta is located in a single House of Representatives division – the Division of Indi. The Division of Indi has been a safe Liberal Party of Australia seat since 1977. Australian rules football and cricket are the most popular sports. There are three Australian rules football clubs in Wangaratta, the Wangaratta Football Club, the Wangaratta Rovers Football Club (both competing in the Ovens and Murray Football League), and the North Wangaratta Football Club, which competes in the Ovens and King Football League. The close proximity of the Rovers and Wangaratta grounds reflects the historical sectarian split in membership of the clubs; Rovers membership being predominantly Catholic and Wangaratta being predominantly Protestant/Anglican. Cricket in Wangaratta is organised by the Wangaratta and District Cricket Association. Clubs include Wangaratta Magpies, Rovers United, City Colts and Bruck Cricket Clubs. The Wangaratta Greyhound Racing Club which held regular meetings at the same venue,has been discontinued. Avian Park is no longer used. Golfers play at the course of the Wangaratta Golf Club on Yarrawonga Road, or at the course of the Jubilee Golf Club at Wangandary nearby. A nine hole course is at Boorhaman to the north of Wangaratta. The main annual event is the Wangaratta Festival of Jazz, which has been attended by thousands each year since 1990. Wangaratta has three secondary schools: Galen Catholic College (private), Cathedral College (private) which has two campuses and Wangaratta High School which has three campuses. The Goulburn Ovens Institute of TAFE has two Wangaratta campuses. The Docker street campus offers a broad range of courses from business studies to music with a central area containing a cafeteria, library and student services. The Christensen Lane campus on the outskirts of Wangaratta is the home for the National Centre for Equine Education as well as providing courses in horticulture. The train station is on the main railway line between Sydney and Melbourne and is usually served by V/Line services between Melbourne and Albury twice-daily as well as a twice daily Countrylink XPT service in both directions between Melbourne and Sydney. Two railway gauges ran in parallel to Melbourne and Albury; the Victorian broad gauge of 1600 mm (5' 3") and the standard gauge of 1435 mm (4' 8½"). The broad gauge line closed in 2008 and will be converted to standard gauge as part of a the North East Rail Revitalisation project. Buses are replacing V/Line services for the duration of the project, while XPT services continue to operate. There was a branch line commenced in 1873, running east to Beechworth, reaching the town in September 1876, but this was closed in January 1977. (Larsen, MayDay Hills Railway). Another branch line ran to Bright until its closure. This has since been converted into a cycling and walking track, known as the Murray to the Mountains Rail Trail. Another short branch line ran west to a wheat silo located on the north side of the Ovens River at Boorhaman. Wangaratta is also serviced by a small regional airport, Wangaratta Airport. A city bus service runs every half an hour during the day on weekdays and on Saturday mornings on a route covering Wangaratta's West End, the business district, Yarrunga and more recently, Yarrawonga Road. Harcourts Connect is a free moving home service that will save hours of time and hassle having to contact multiple providers including , insurance, removalists, storage, gas electricity, telephone, internet and Pay TV and even links to change of address updates for mail redirection, drivers licence and electoral rolls.